In recent years a radically new category of inertial sensors has developed based on technology, called Molecular Electronic Transfer (MET). Unlike commercially available sensors, MET sensors use a liquid electrolyte as their inertial mass. They do not contain any precision mechanical parts or springs and are relatively simple to manufacture. Molecular electronic transducers (MET) are a class of inertial sensors (which include accelerometers, gyroscopes, tilt meters, seismometers, and related devices) based on an electrochemical mechanism. METs capture the physical and chemical phenomena that occur at the surface of electrodes in electrochemical cells as the result of hydrodynamic motion. They are a specialized kind of electrolytic cell designed so that motion of the MET, which causes movement (convection) in the liquid electrolyte, can be converted to an electronic signal proportional to acceleration or velocity. MET sensors have inherently low noise and high amplification of signal (on the order of 106). MET sensors represent a disruptive technology that will fundamentally change the economics of most inertial sensing applications. It is expected that the cost/performance characteristics of MET TECHNOLOGY products will enable new uses of inertial sensors and open up additional markets. MET devices will be able to deliver performance characteristics typically associated with laser and fiber-optic (FOG) instruments at a price that is comparable with Micro-Electro-Mechanical Systems (MEMS) devices. Compared with MEMS, MET devices offer dramatic improvement of crucial performance characteristics in the measurement of linear and angular acceleration and velocity - improvement on the order of 10 to 100 times for certain parameters. When a voltage in the range of ~ 0.2 to 0.9V is applied across the electrodes, these two reactions occur in a continuous fashion. After a short time, the electrochemical reactions deplete the concentration of triiodide ions [I3-] at the cathode and enrich it at the anode, creating a concentration gradient of [I3-] between the electrodes. When the cell is motionless, the electrochemical reaction is limited by the diffusion of I3- to the cathode (a slow process), and the current dies down to a low steady-state value. Motion of the device causes convection (stirring) in the electrolyte. This brings more I3- to the cathode, which in turn causes an increase in the cell current proportional to the motion. This effect is very sensitive, with extremely small motions causing measurable (and low noise) inertial signals. In practice, the design of the electrodes to create a device with good performance (high linearity, wide dynamic range, low distortion, small settling time) is a complex hydrodynamic problem. MET seismometers introduced in 1990's considered as a low-cost alternative to traditional force-balanced sensors with capacitive transducers. Their performance was at the entry level more suitable for educational purposes (like the Princeton Earth Physics Project) than for general seismology applications. The lack of temperature and long-term stability, non-identical amplitude and phase responses prevented these instruments from wide use despite the low cost and acceptable sensitivity. 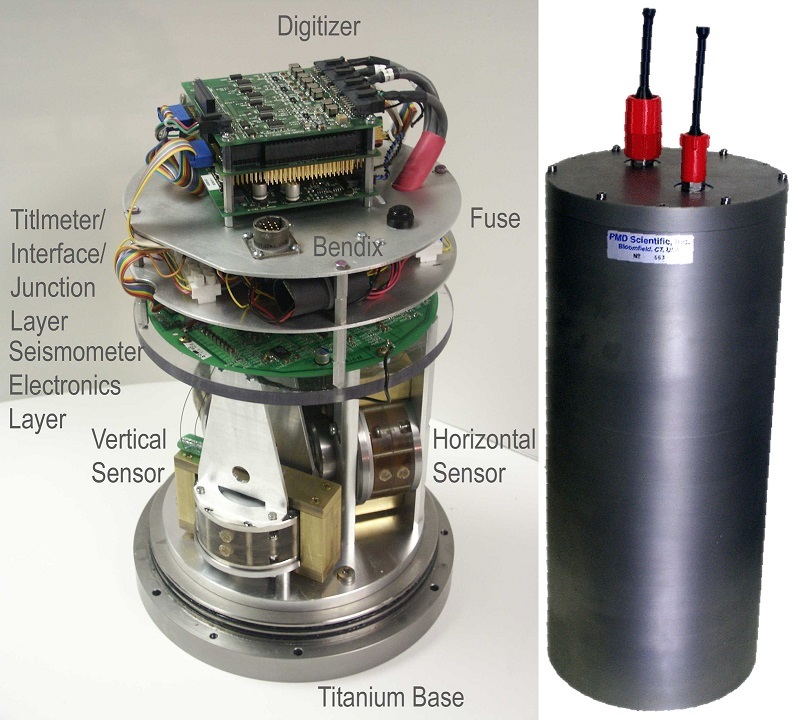 The introduction of the Force-balanced MET seismometers in early 2000's(picture on the left) allowed the MET technology to reach almost the same level of performance as traditional electromechanical sensors. 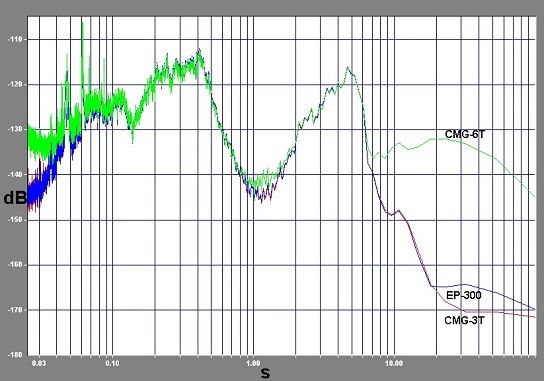 The example picture on the right shows the deep vault spectra of the EP-300 MET seismometer compared to CMG-3T(top performance sensor) and CMG-6T(entry level sensor). One can see the identity of the seismic data and the MET sensor noise level approaching to the best in its class.